In this guide, you’ll find in-depth info on how to mount your TV on a wall. Our short video should help you decide whether you’re up to the task. If you opt not to do it yourself, look for a certified professional installer in your area. Check the screen sizes that the bracket says it can hold, and stay within the appropriate range. Check the maximum weight a bracket can hold to be sure it can support your TV. Ideally, the middle of your TV screen should be at eye level when you’re seated. Mounting it too high can result in neck strain. Plus, the picture will look its best when viewed as close to head-on as possible, rather than at an angle. If you do decide to opt for a higher placement, consider using a tilting wall mount so you can angle the TV down. Check your TV’s owner’s manual for mounting height tips. Better yet, use our height finder application. Flip open any home decor magazine, and you’ll likely find an image of a sleek flat-panel TV mounted above a fireplace. Based strictly on appearance, it’s a great choice. And home builders often run power and video cabling to that location, so it’s easy, too. Even so, it’s seldom the best option — and not just because it’s too high on the wall. If you have a wood-burning fireplace, and you actually light a fire occasionally, we’d recommend not mounting a TV above it. A wood fire generates heat and smoke, neither of which is good for the long-term health of your TV. Now, if you have a gas fireplace, that’s different. A gas fire burns very cleanly, and this type of fireplace usually has special venting to disperse the heat, so it’s not concentrated on the wall above. It’s a good idea to figure out how you’d like to manage your wires before deciding where to mount your TV, since some locations will be more install-friendly than others. If you’d like to run your wires on the outside of your wall, you can use paintable cable management raceways to hide your TV’s A/V and power cables. If you need to run cables further than just straight down to your A/V cabinet, check out our article on managing your A/V cables for some simple options, like running wire behind your baseboard or crown molding. By running your cables in places that won’t require drywall repair, you’ll save yourself lots of time and effort. 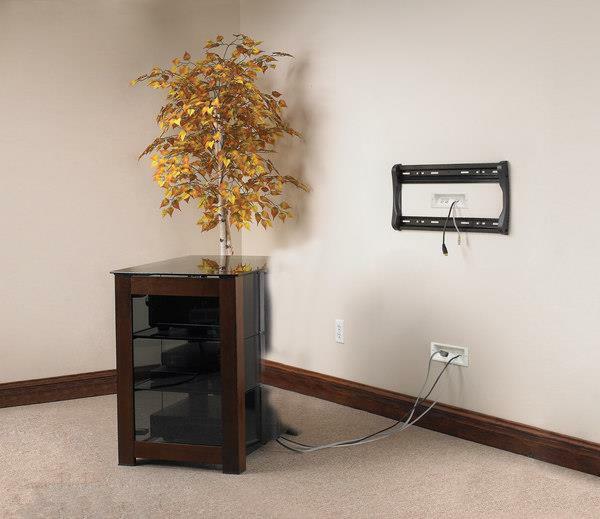 The Sanus PowerBridge system lets you neatly run power and A/V cables behind your wall to a mounted TV. Both the “input” and “output” panels come pre-wired for easy snap-together power connections, and they include openings for your A/V cables. Follow your local building and fire codes. In many cases, this means you’ll need to get UL-rated A/V cable labeled CL2 or CL3. Some TV wall-mount brackets have pre-existing holes for A/V cables. Before you start cutting drywall, drill a pilot hole and explore the space behind the wall, to make sure it’s free of electrical wiring and plumbing. Cut the hole using a manual drywall saw. Don’t route your TV’s power cable through your wall — it’s not rated for safe in-wall installation. If you want to keep that cable hidden, you’ll need to use a kit like the Sanus PowerBridge. Or you can hire an electrician to install a recessed AC outlet on the wall behind your TV. Turn off the power in areas you’ll be drilling or cutting to avoid electric shock.